I received some pretzels in a hamper for Christmas. While I don't hate pretzels, they are not something I turn to if I have the munchies. Not wanting to waste the pretzels, I decided to make cookies with pretzels in. The Momofuku Milk Bar Compost Cookies had too many steps for me on a week night, so I instead searched for a simpler recipe, and landed on this one for Chocolate Chip Pretzel Cookies. I got 16 cookies rather than 10 using a small icecream scoop as the size guide. 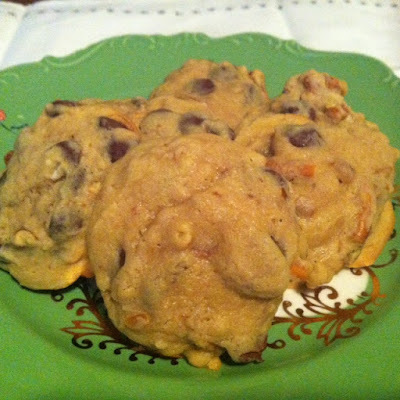 These cookies were delicious - salty and sweet, with soft cookie dough embracing crunchy pretzel pieces. They were a definite winner for me. I am always on the lookout for interesting new recipes for dinner, and I found one in the January/February 2016 edition of Taste magazine - for a Tomato and Tamarind Chicken Curry. 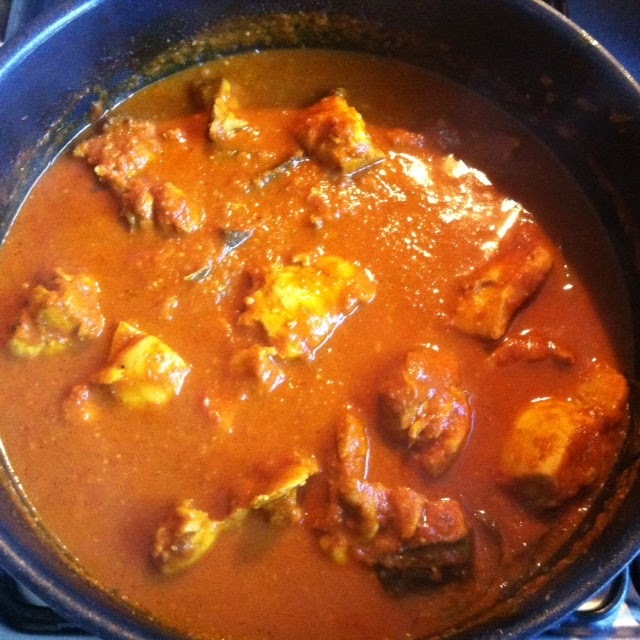 I do love a good curry, so this recipe was a winner for me. I didn't have any tamarind and was not prepared to pay $5 for a jar of which I'd use 2 tablespoons, so after some Internet searching, I used two dried figs and a tablespoon of vinegar instead. The curry tasted great - I really enjoyed this curry served with boiled brown rice and blanched broccolini. Heat 1 tablespoon of the ghee or oil in a large shallow casserole dish, add the onion, tomato, garlic and chilli, season and cook for 10 minutes or until caramelised. Transfer the mixture to a blender or food processor and add ginger, tamarind, curry power and sugar. Process until smooth. Heat the remaining ghee or oil in the casserole dish. Add cumin and curry leaves and cook for 1 minute or until aromatic. Add the blended tomato mixture and cook for 4 minutes then add the chicken. Cook for 5 minutes. Add the water, cover and cook for 15 minutes or until chicken is cooked, stirring occasionally. Season and serve. For Eating with Ellie this week, I chose Rainbow Chard with Sunflower Seeds and Dried Figs. 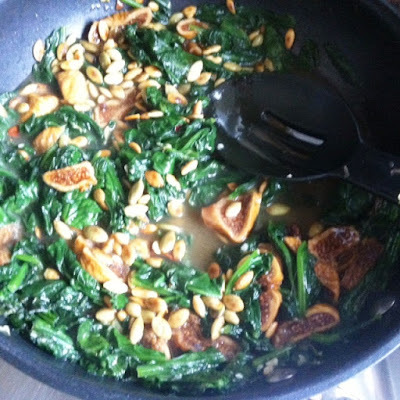 As often happens, I substituted near-to-but-not-quite ingredients to use what I could readily find or already had - for the rainbow chard, I substituted spinach, and for the sunflower seeds, I substituted pepitas. Basically, this dish involves toasting the seeds, then setting them aside while you sautee the greens in a mixture of chicken broth, garlic and lemon juice. The seeds, sliced figs and lemon zest are added at the end. I really enjoyed this dish - I really didn't feel like making it when I did, but when I tasted it, I changed my mind. It's a little bit savoury, a little bit sweet and all kinds of goodness. 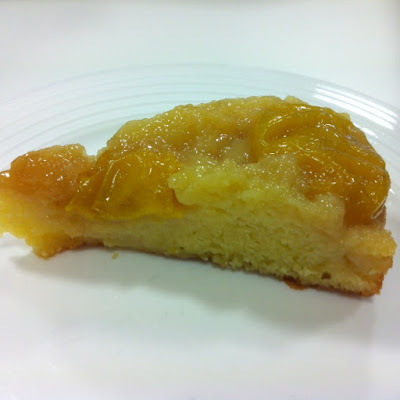 It's our second Tuesday with Dorie week for January, and the second recipe is Lemon Squares, French Style. Basically, Dorie creates an almond meal laced crust and crumb and fills it with a tangy lemon curd, and adds crunch with some chopped almonds on top. A comment from some of the bakers who made these lemon squares the first time around was that the crust was too thick and should be halved. However, the crust and crumb dough is the same - one third is used for the crumb and two thirds for the crust. I didn't want to waste any of the dough, so I made the bars with the full quantity of dough. Maybe because I didn't have any expectations of what lemon bars should be like (in Australia, the closest thing we have is the lemon slice, a really thick no-bake base topped with lemon icing), I didn't mind the thickness of the crust. I just loved everything about these bars - the lovely biscuity smell, the buttery crumb, the tangy filling and the crunchy toasted almonds on top. I confess that I did not make the curd from Dorie's recipe, as I had a whole jar of lemon curd that my brother had bought for me from a market, so I used that instead. 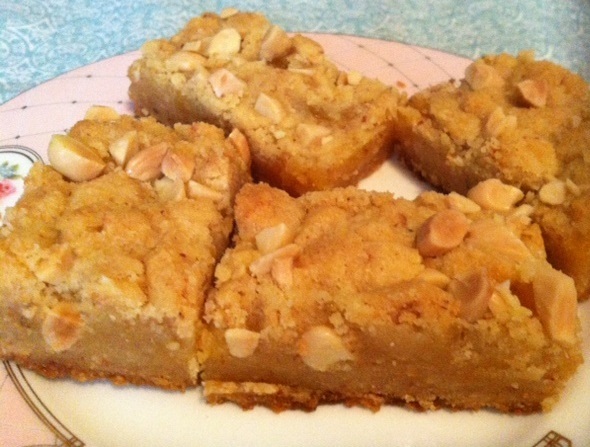 I really liked these lemon squares - I would definitely make them again. To see what the others thought of these bars, visit the LYL section of the TWD website. It is Australia Day today, so I hope that everyone in Australia is enjoying the public holiday. I have a slight obsession with green plums, so when I saw some in DJs recently, I had to buy some. Originally, I had visions of making another plum tart. However, this started to become too much trouble in my eyes, so I procrastinated as to what to do with my plums until the time came when I had to use them or lose them. You know that cake baking is my passion, so of course, I wanted to make a cake with my plums as the star. However, I didn't want the cake to be too much effort eg cake plus filling plus streusel, as that meant I was facing the same issue as with the tart. Google came to my rescue, and I found this recipe for Green Plum Dessert Cake on The Baking Brunette. There is a reason, I believe, why she doesn't have a photo of the whole cake - that is because it really doesn't look that pretty, as the top is all lumpy and bumpy. However, this should not put you off - this cake is delicious, as you can see from my photo of a cross-section of the cake. It is moist and reasonably light, and the slightly tart topping contrasts well with the sweetness of the cake. The verdict - I loved this cake. It was easy to make, tasty, and fits in well with my adoration for green plums. 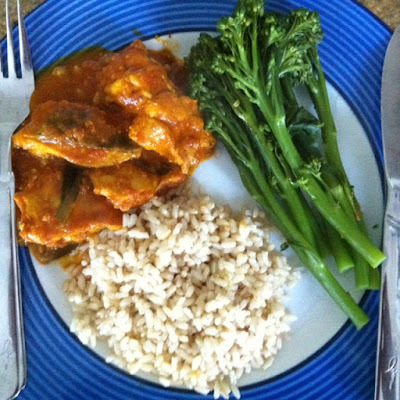 This week's Eating with Ellie dish was chosen by Peggy. It is mushroom sloppy joes. Yep, even though this dish looks like a regular sloppy joe with mince, the "mince" is actually diced capsicums and mushrooms. It sounds weird, and it smells weird, but it tastes OK. Certainly, the filling doesn't taste like beef mince, but it is a reasonable facsimile thereof if you happen to be vegetarian or just wanting to reduce the amount of meat in your diet. Would I make these again? Unlikely. However, it was an interesting experiment, and I was fascinated how the predominately green vegetable mixture was transformed to something closely resembling mince. I am loving the breakfast recipes in Jamie Oliver's Everyday Super Food book. 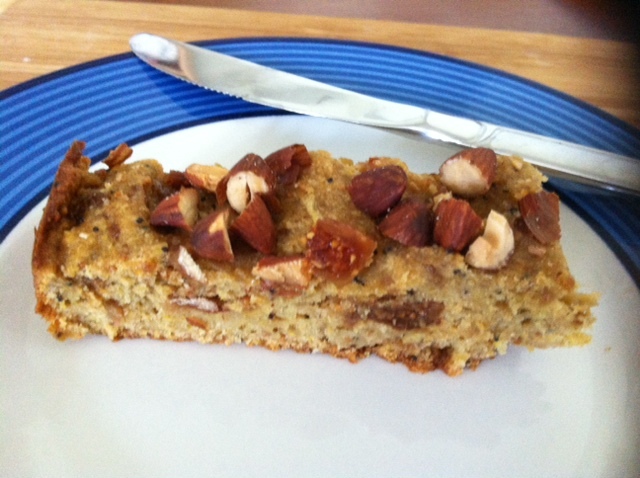 My third breakfast recipe from that book is the Figgy Banana Bread. The recipe is posted here, but I recommend buying the book so that you can see the full range of recipes - they are innovative, delicious and healthier than the norm. What was surprising about this recipe is that there is no added sugar - all the sweetness comes from dried figs, ripe bananas and apple. There is also a lovely crunch from almonds and poppy seeds. It is simply delicious! Who knew that a cake could be so sweet without added sugar. I served this cake plain - I skipped the blood orange butter that Jamie makes in the book. I think it is lovely on its own, though you can make the blood orange butter, or use nut butter, or perhaps serve it with yoghurt. Whichever way you like it, I recommend making this figgy banana bread. There were eight attendees at our meeting - Dalya, our leader, and her sister in law, Laura, as a guest; Abi and her seven week old son Joe (not in the attendance count); Corrinne; Sue; our two new members, Lindsay and Marcus; and me. She made the elegant chocolate curls by drying melted chocolate over a rolling pin. This delightful cake came from my new baking book, Bake It Great by Luis Troyano of Season 6 of the Great British Bakeoff. 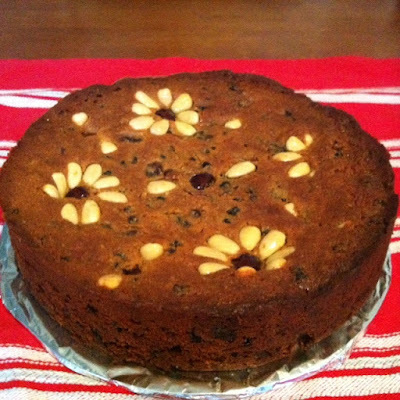 It was not at all heavy, was pleasantly sweet because of the honey and muscavado sugar on the batter, and was filled with luscious dried fruit (in my case, raisins, currants and apricots - I had no sultanas as stated by the recipe). We accompanied our cake with a beverage of choice (in my case, Prosecco), and tried as much of each cake as we dared. As usual, the cakes were all delicious and a credit to our bakers. It was another fun meeting of the Melbourne Cake Club. Next month's theme is Nuts. Our Eating with Ellie dish this week is Sesame Quinoa, chosen by Chaya. However, I cannot eat quinoa, so I substituted wholemeal cous cous for the quinoa. Toasted sesame seeds and scallions flavour the cous cous. 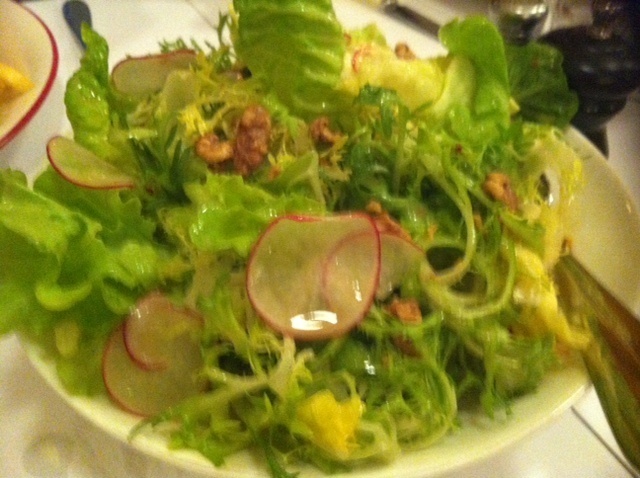 I liked this side dish - very simple, hardly a recipe, but good all the same. 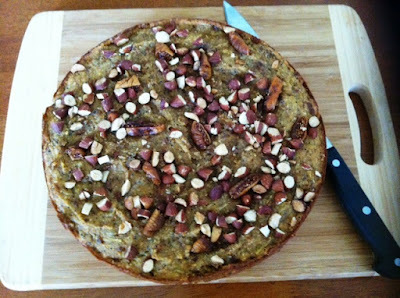 For Tuesdays with Dorie this week, our recipe is Fluted Carrot Tangerine Cake. However, Dorie gave us the option of subbing oranges for the tangerines, which I did. This cake is very simple to make, and has the flavours of carrots, orange and ginger. There is also an optional glaze, but I skipped it and served my cake plain with a dollop of yoghurt on the side instead. This cake was simple and delicious. It was definitely a winner for me. To see what the other bakers thought of this cake, visit the LYL section of the TWD website. Breakfast is a meal that I sometimes struggle with - not because I don't eat it, but because I get bored with the same thing all the time. That means that I am always looking for tasty alternatives to cereal and milk or toast. 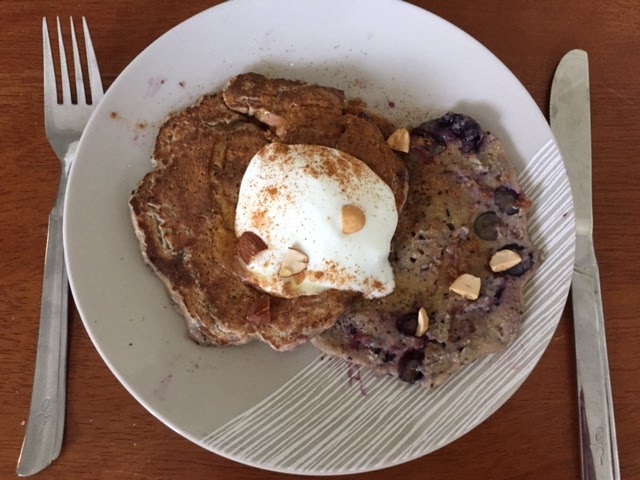 On the weekend, I dug out Jamie Oliver's Every Day Super Foods, and hankered for the banana and blueberry smoothie pancakes. As it was Sunday and I wanted something a little different, I made them. These pancakes are really tasty. The batter is very thick - don't worry about that, as that is how they are supposed to be. However, mine were too thick so I had to loosen up the batter with a little more milk so that I could spread the batter in the pan. The pancakes have no added sugar and are cooked without oil or butter. This means that they are much healthier than you average pancake. Sure, they are not light and fluffy melt-in-your-mouth discs from heaven, but with all the berries in them, they are super juicy, and the accompaniments of yoghurt and honey add more moistness and sweetness. Put half of the blueberries, the banana, milk, egg and flour in a blender, and pulse to make a smooth (but thick!) batter. Scrape the batter into a bowl and fold through the remaining blueberries. Place a non-stick frying pan on a medium-high heat. Once hot, spoon the batter into the pan to make pancakes of the desired size. (I used a small one-pancake sized frypan). Cook the batter for a couple of minutes on each side, or until crisp or golden. Serve the pancakes topped with the yoghurt, a sprinkle of cinnamon, the chopped nuts and a drizzle of honey. Jamie also states that he likes to cut the pancakes in half so that you can see the fruit inside - not essential, but it turns one chunky pancake into two thinner ones. A lifetime ago, I posted about Gills Diner in Gills Alley, Melbourne. Since that time, I had the pleasure of dining at Gills Diner a number of times. In September last year, there was a changing of the guard, and Gills Diner morphed into Trattoria Emilia. 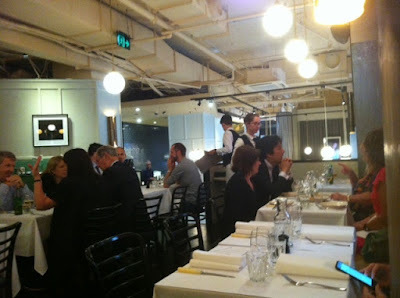 Instead of a European menu, Trattoria Emilia has narrowed its range to an exclusively Italian one. Trattoria Emilia is not named after a beautiful girl, as you may think on first glance, but rather, after the Emilia-Romagna region of Italy. I have dined at Trattoria Emilia twice - once for lunch and once for dinner. I have also been there once for a pre-Christmas coffee, where we ate the most beautiful melt-in-your-mouth fruit mince pies ($3.50 each) from their bakery section. On all occasions, the service has been hospitable and prompt. As Trattoria Emilia is popular, I recommend booking to ensure that you have a table. Both dishes were superb - simple, tasty, perfection. There is nothing else to add. I have noticed on the Trattoria Emilia website that the gnocchi now has a seafood sauce. This is perhaps great news for seafood lovers, but sad for vegetarians, as this was a perfect vegetarian dish. If you love Italian food, do try Trattoria Emilia when you are in town - or drop in for a coffee from their shiny espresso machine and a pastry. For Eating with Ellie this week, Margaret chose Chicken and Broken Noodle Soup. This was a really simple dish to make, but the end result was delicious. I only made a half batch, but it was so good, I wish that I had made more. A half batch made two very hearty servings of soup. Just before Christmas, I bought a new baking book, Bake It Great by Luis Troyano. As I have lots of baking books, I am quite fussy about what I buy now - the standard cakes, pies and tarts won't cut it for me anymore. Although I had no idea who Luis is (I now know he was on Season 6 of Great British Bakeoff), I bought this book because it had innovative, interesting recipes that looked great without being too hard or intricate. There are lots of recipes in this book that I would like to try. I kicked off with the Chocolate and Nut Clusters as an Epiphany bake. I had meant to make the impressive Spanish equivalent of a king cake, but I messed up and made the wrong recipe. However, this one is a good stand in, I think - it is bright and colourful, just like an Epiphany cake should be. 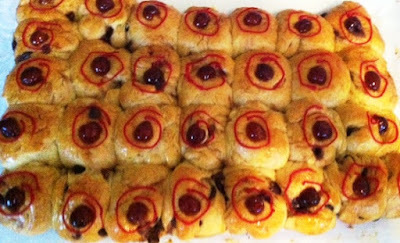 The chocolate and nut clusters are not a cake at all, but are little bread buns studded with chocolate chips, and each one concealing a single nut, a bit like the baby in a king cake. The only tip I have for making these buns is not to start them at night after work - I was up until 11.30pm making them because of the rising process. Put the boiling water and milk together in a jug to make a warm liquid. Place the flour, zest, yest, sugar, salt and 1 of the eggs (beaten) into the bowl of a stand mixer, keeping the salt away from the yeast. Place the bowl in the mixer, and add 2/3 of the fluid. Using the dough hook, combine the ingredients. Add the remaining fluid a bit at a time until you have a coherent soft dough (you might not need all of the liquid - I didn't). Cut the butter into small pieces, and beat the pieces, one at a time, into the dough until it is fully combined and glossy. Place the dough into a large, well oiled bowl, cover the bowl with plastic wrap, and place in a warm place and allow the dough to rise to twice its size (~2-3 hours). Turn the dough out onto a lightly floured bench, punch it down, and press it out into a large circle. 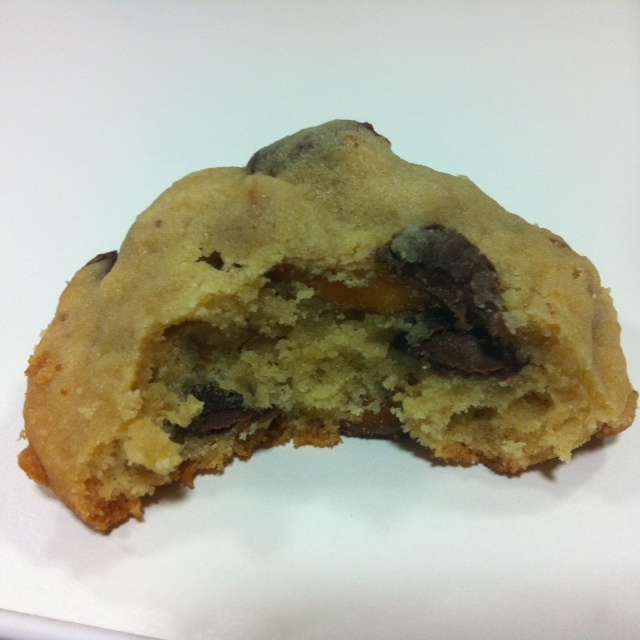 Add the chocolate chips to the dough and knead them in until evenly distributed throughout the dough. Divide the dough into 3 equal pieces, and roll each piece into a sausage shape. Divide each of the three pieces into ten equal size pieces (30 in total). Take each of these smaller pieces and roll it into a ball between the palms of your hands. Place a single nut in the centre of each ball, then fold the dough over the nut and roll the dough back into a ball. Place the ball onto the lined baking tray. Repeat with each of the balls, placing them ~ 1cm apart on the baking tray. Place the baking tray in a large plastic bag (taking care to ensure that the buns don't touch the bag) and allow the buns to rise for an hour or until approximately doubled in size. 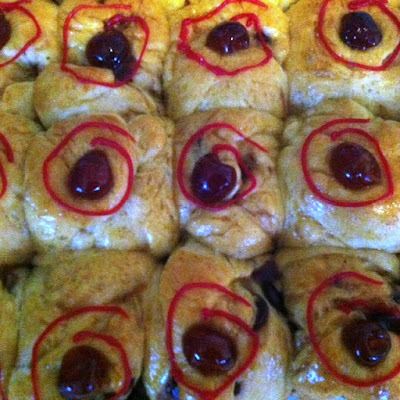 Beat the remaining egg and brush the egg liberally over the top of the buns, then top each bun with a cherry half. Place the buns in the oven and bake for 25-30 minutes or until golden. Remove the buns from the oven and allow them to cool completely on a wire rack. Once cool, pipe a spiral of icing around each cherry. Serve with butter. During the Christmas break, my family visited the famous Rudd's Pub in Nobby, about 35 minutes' drive from Toowoomba. Rudd's Pub is named after the author Steele Rudd (Arthur Hoey Davis), who apparently used to write his Dad and Dave stories in the corner of the structure, which has been around since 1893. Nobby was also the town where Sister Elizabeth Kenny grew up. Sister Kenny developed a revolutionary treatment for polio. Consequently, there is also a wall dedicated to newspaper articles on Sister Kenny in the pub. The pub menu is extensive - there is something for everyone. The most popular items appeared to be the burgers, but there was plenty of other dishes to choose from. With respect to my dish, the pork was cooked well and tasted great with the BBQ glaze (although I was stumped in the end by the two large pork fillets - definitely a man-size serving). The chips were also crispy and delicious. However, I could have done without the mash (which seemed unnecessary with the chips), and the carrots and beans could have done with a good dose of seasoning. That said, if you enjoy generous serves of hearty food at a good price, then the meals at Rudd's Pub could be right up your alley. The pub was very popular with the punters - we went on a Tuesday lunchtime, admittedly during the holidays, and the place was soon buzzing. Although we arrived at noon when meal service began and ordered shortly afterwards, it took nearly an hour for our meals to arrive - a factor to bear in mind if you plan to visit Rudd's Pub. If you are a fan of the Dad and Dave stories, have a yen for looking at rural memorabilia, or just travelling through the Nobby area, Rudd's Pub is a fun, casual place to stop off for a meal. Just before Christmas, one of the teams at work went for Christmas lunch at Entrecote Parisian Steakhouse and Bar in Alfred Place, Melbourne. The menu is, as you can imagine, very French. 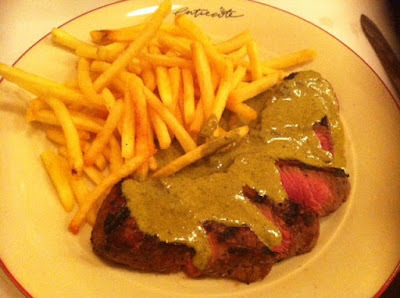 However, the team member who organised the lunch is a regular at Entrecote, and recommended the Steak Frites, so that is what we all had. The Steak Frites ($44.90) comprises a grilled Hopkins River porterhouse steak cooked as you like it (I had it medium rare), served with frites (French fries), a butter and herb sauce, and a leaf salad with radish, walnuts and vinaigrette. The steak looked huge, but everyone managed to polish theirs off without any difficulty. The highlight for me was the lovely butter and herb sauce, which was delicate yet tangy and spicy at the same time. Entrecote is not the place for a cheap and cheerful catchup, but if you are looking for something a little special, and like your food with a little French flair, Entrecote may be the place for you.